Roma Piotrowska: How would you describe the nature of your work? Justyna Scheuring: I design experiences, mainly for those who choose to participate in social and cultural events. I’m doing this to ask questions about life, social participation, and presence itself. Roma: You sometimes stay behind the scenes directing your performances, but on other occasions you are the main performer; Could you tell me about these ways of working? Which one is more interesting for you? Justyna: They stretch my limits in different ways, but they are equally interesting to me. I used to create site-specific installations in the past, and it was from that context that my first performances emerged. I started incorporating my own presence by reading my poetry inside those installations, and by adding simple actions and gestures to transform the created situation in-between the words. I have always been fascinated by language, and how it activates individual associations in different ways. These performances allowed me to combine all the different media I had been using so far into time-based compositions. These compositions were a sort of a multi-layered reality, where my performing presence was equally as important as all the other elements of the work: the words, objects, gestures, places etc. It sometimes felt as if I was composing these works like music. I was specifically interested in composing communication between ‘incoherent singularities’, by which I mean things that aren’t united by their functional purpose, but by their existence in the same place, at the same moment in time and in proximity to each other. I tried to understand how meaning is produced. The performative events were a natural expansion of these thoughts. I direct situations, which combine parts of our commonly shared reality. Roma: What was your initial inspiration for creating these events? Justyna: It all started in Poland, with the observation of the behaviour of crowds. Shortly after moving to London, I became interested in creating a sort of invisible performance, something that would have a visceral impact on the audience, but still remain to some extent unrecognised. I was always interested in subverting obvious meanings, and searching for ways to evoke what is and isn’t at the same time. Earlier I was exploring these ideas through installations. In 2007 I chose to work with already existing conventions of social participation which we all are so familiar with: a lecture, a slideshow or a gig etc. I also became interested in the presence of people in groups, performing their professional roles. These roles provide them with different levels of visibility – or even a sort of invisibility. Catering assistants are a great example of such professional invisibility; they are everywhere, but no-one really pays attention to them. They usually work in groups, they often move together through overcrowded rooms. They provide service to others to whom they emotionally differ from, and that is where I spotted a performative quality which I wanted to highlight. 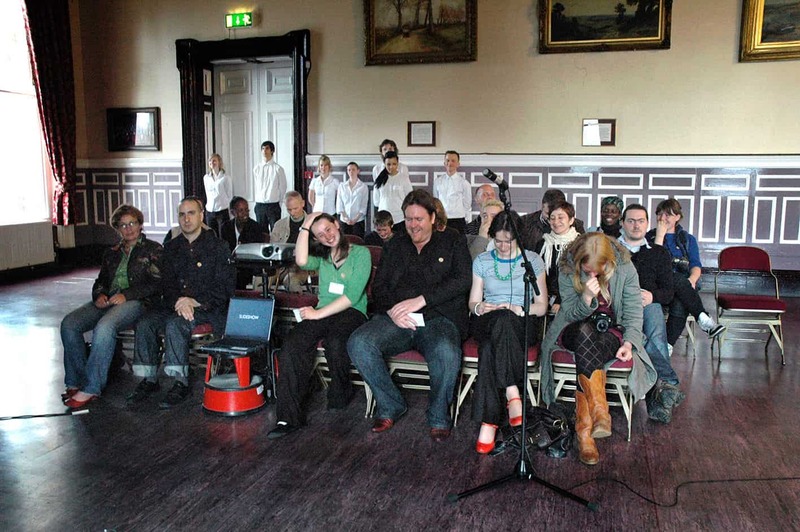 During the 2008 PULSE Fringe Festival in Ipswich, I presented Slideshow. 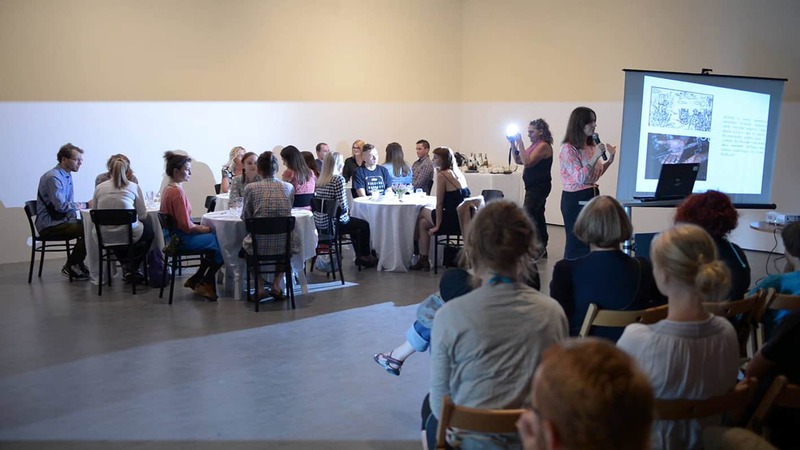 It was the very first performative event which I designed as a ‘frame’ for a meeting between two groups of people to take place: an audience and a team of catering assistants. The catering assistants were silently servicing a presentation of photos with no lecturer introducing them. They were bringing technical equipment, additional chairs, serving tea and coffee, removing empty chairs at the end of the event, and so on, all the usual activities. This work was followed by PERFORMANCEinstallation in 2008 and Spontaneity Exercise in 2011 which took place during exhibition openings. 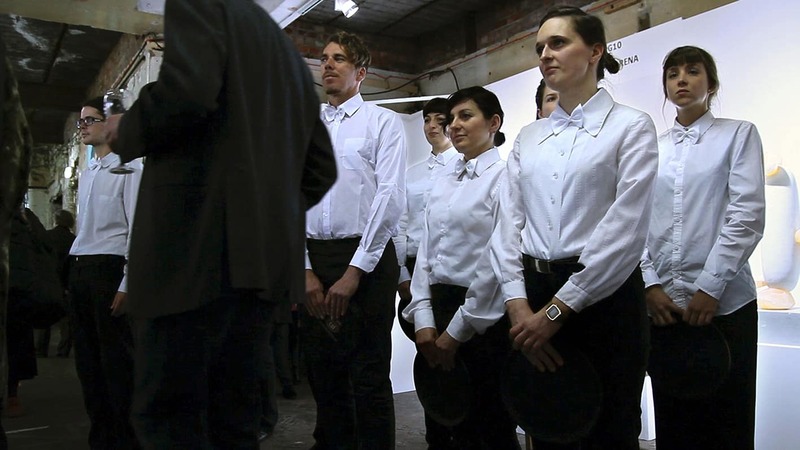 In each case, the normally dismissable presence of the catering assistants was slowly gaining visibility. The distinction between groups remained till the end, however the emotional atmosphere in the room significantly shifted; from avoidance, to anticipation or impatience, to inhibition, and even to some kind of serenity. I think I have always been fascinated by creating the possibility within an experience, for people to get present with the moment they were in, and face their own presence in the eyes of others, while gently reverberating each other’s emotional disposition. Roma: Your audience often do not expect what you prepare for them. 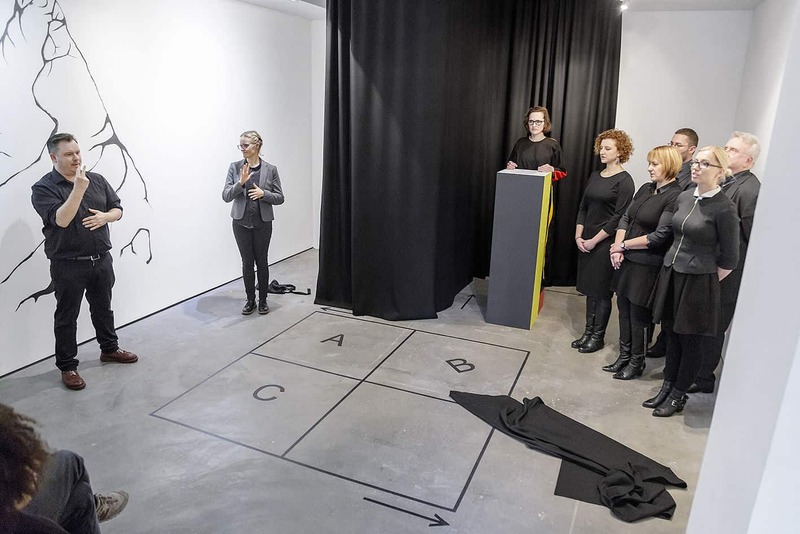 You don’t really have their consent, like in your performance I don’t participate, but I love you, organised in The Centre of Contemporary Art in Toruń. Could you please tell me a little more what happened there? Justyna: The nature of performance as a medium is transitory, unpredictable and can be subversive. At the Centre of Contemporary Art in Toruń, I arranged two events which took place simultaneously in the same room; one was a pop-up dinner, and the other was a lecture titled “Sexuality in Buddhist Culture (Tantric Yoga)”, which was presented by Dr. Katarzyna Lewandowska, a charismatic art historian from the Nicolaus Copernicus University in Toruń. 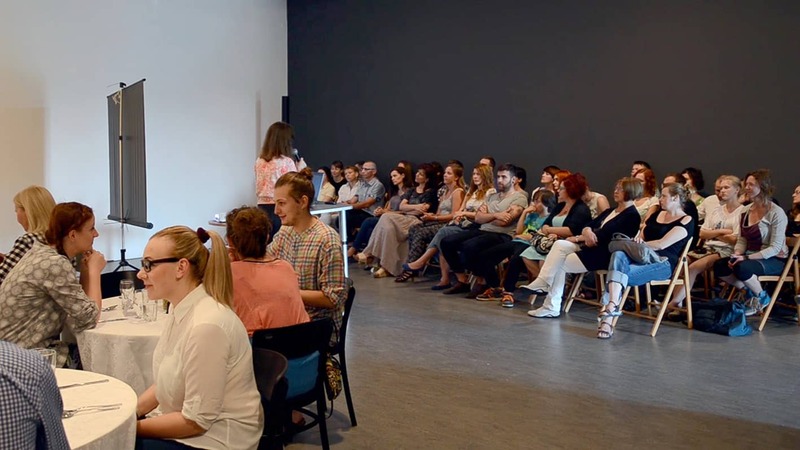 The dinner was advertised in a local newspaper, and it attracted a variety of people, including some with no real connection to these kinds of events or art. They were offered nice food, wine and hospitality. The audiences showed up for each of the events not knowing of the artist’s involvement. Both groups received what they came for, but with a little unexpected addition – the presence of each other. Roma: One could say that you manipulate the audience, experiment on them; they are also co-creators of the outcome of your work, so you empower them as well. Could you elaborate on this? Justyna: In I don’t participate but I love you, I didn’t give the participants any additional role; they remained the audience throughout the event they chose to participate in. This set-up allows the emotional characteristic of one group to meet the emotion generated by the other, and together create a third, invisible and unpredictable emotional reality. All individual responses within the space of this third emotional reality, reveal our survival mechanisms and become a part of the entire experience. This is what turns the audience into participants, co-creating a performative outcome. Roma: Was there an opportunity to switch places? Justyna: There was such an opportunity, but most people stayed with the activity that they originally came for. Some participants were interviewed after the event, and their responses ranged from confusion through to enjoyment, and also to questioning. These emotional clashes between groups or individuals occur in our everyday life constantly; they hold the possibility of conflict as much as of love or amusement. Roma: A similar situation took place during your performance The past is ahead of us at King’s College in London. Justyna: Yes, there were two lectures taking place simultaneously in the same room, with a minimal intervention by a third group, which just passed through in the middle of the event. Roma: What was the context of the work? Justyna: This performance was part of the 2016 Arts and Humanities Festival, which was titled ‘Play’. I was discouraged from fully hiding its subversive nature, so a careful reader of the festival brochure expected a performative lecture. However, the second lecture simultaneously happening in the same room was a surprise. Roma: Who gave the lectures, and was their content important? Justyna: Alan Read, Professor of Theatre, and Myka Abramson, PhD Lecturer in Contemporary Literature, Culture and Theory, accepted my invitation to present for this performance. I asked the academics to decide on their own contribution. In her talk, Myka Abramson explored how culture is turned into a hidden weapon of neoliberalism, while Alan Read gave a beautiful, personal and also timely lecture, on the commodification of the University itself. These subjects attracted different audiences, and created different emotional micro-climates; the meeting of these two micro-climates in the same space flavoured and determined the uniqueness of the moment. Alan Read and Myka Abramson have my deep gratitude for their generous input. Roma: You mentioned earlier an intervention by a third group, what happened? 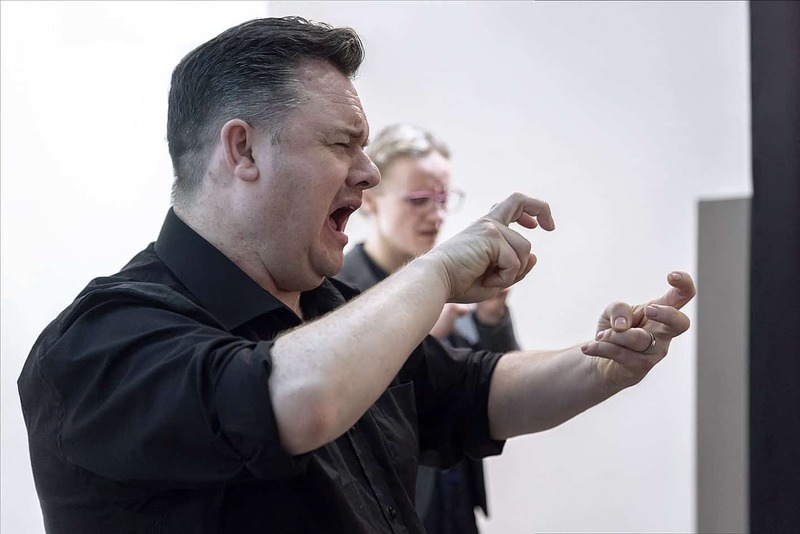 Justyna: Daniel Oliver, a performer and academic, agreed to bring one of his regular gatherings of artists working with dyspraxia to a neighbouring room, and – assisted by the festival’s ushers – they passed through the room, interrupting the lecture. This minimal intervention remained almost invisible within the lectures that were presented, but it reverberated within people’s perception and memory. All involved groups of people mingled at an after-party, which was not planned by me, but I thought it worked really well as a part of the entire experience. If I ever have a chance to bring this event together again, the after-party will be there too. Roma: What is the purpose of these encounters? Justyna: I create these meetings to provoke an unexpected rush of emotions for all people involved (including me), leading to a questioning of individual reactions and existing behavioural and societal conventions which we all accept as ‘normal’ and ‘usual’. Confusion can be a bit uncomfortable because it invokes chaos and breaks established patterns, yet it also encourages a creative search for new possibilities of interpretation. As a consequence, it may open up a parallel universe of potential viewpoints to our being together. The physicist Niels Bohr said: “Everything we call real is made of things that cannot be regarded as real”, and when you really breathe this concept in, you breathe out into a cosmos of oneness. Justyna: All of my performances that overlap two ‘realities’ play with the spectators’ perceptions, including their ability to focus and select. Each person can tune into one or the other voice, one or the other reality, or take it as a whole. These projects also provoke the audience members to reflect on their own viewpoints. Roma: Do people usually use the opportunity (presented in your performances) to change the course of events, or do they choose instead to sit tight? Justyna: In Poland and the UK, people haven’t opposed too much, but they responded with openness, seldom with irritation. I believe different geographical locations may reveal different responses. 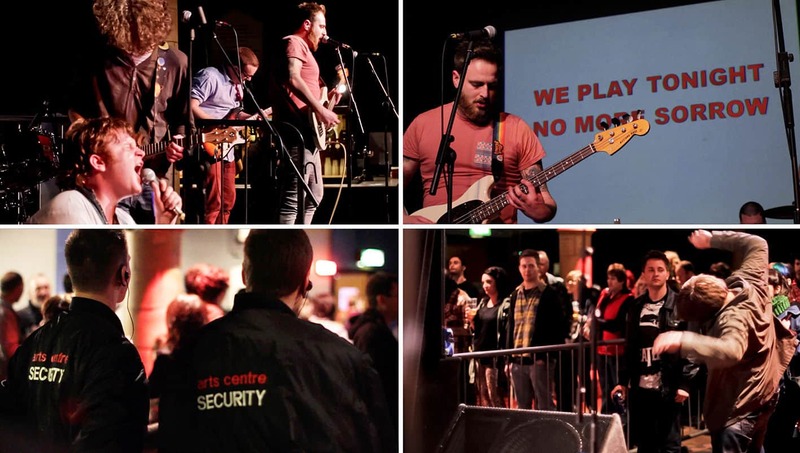 In 2012 I made WE PLAY TONIGHT NO MORE SORROW, a project which was supported by the Polish Cultural Institute in London, and the incredible Colchester Arts Centre where it took place. I would love to see this work happen in many different places; some time ago, I even found partners in Beirut who were excited by the opportunity to hold the event, but sadly I was not successful in securing funding for this undertaking, and it didn’t take place. I still hope to do it there one day, there and elsewhere too, to see the variety of participant responses and outcomes. Roma: What was that performance like? Justyna: WE PLAY TONIGHT NO MORE SORROW is again based on the idea of a meeting between groups of people. This time the groups mirror each other; both groups come as audiences for different gigs, and are led through different doors into one room. 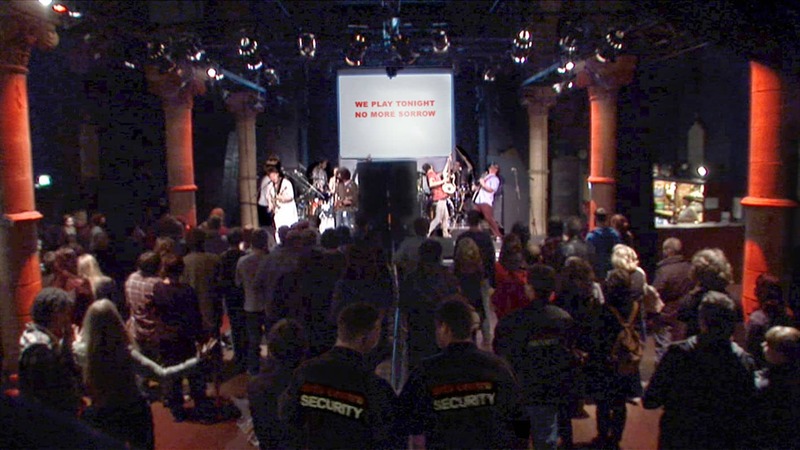 The room is divided with a metal crowd barrier, with security guards standing on either side. There are two stages, one on each side of the barrier, and two rock bands play their individual sets simultaneously for 35 minutes. The event in Colchester was a truly unforgettable experience. After the initial confusion the impression was of two channels of music joining and disconnecting, then again joining and again disconnecting and by the end there was a sense they were playing like one, even though the bands were still playing separately. I think they united on an emotional level. My focus was on people’s reactions. It was interesting to watch how people embraced the unexpected situation, which was entangled with their temporary group identity and the physical division. A few people broke through the barrier. Roma: So the audience didn’t expect two bands playing together? Justyna: No they didn’t… They knew that their band was collaborating with a performance artist whose name was Justyna Scheuring, but most probably they expected me on the stage. Roma: In your recent work you explore spoken language and communication and miscommunication. Is there any particular reason why you are interested in the subject of communication? Justyna: I think I forgo meaning in favour of creating space for not-understanding. The not-understanding becomes a point of connection from which we can start to embrace difference. Last year, the Arts Council supported Everyone, Merry-Go-Round with a grant, which allowed me to hire a group of professional translators to translate me as I spoke Polish. There were five Polish to English translators, a Polish to British sign language translator as well as one British sign language to Polish sign language translator. I was interested in becoming one, inter-communicating body that plays with meaning in many different ways, while at the same time having my speaking amplified by a group of people – something like a human microphone. It all became possible because of the translators’ professional presence, which at once communicates, but remains minimally visible. Roma: Was it possible for non-Polish speakers to understand clearly? Justyna: There was a variety of overlapping voices, which made it difficult for English-speakers to fully understand, but understanding was possible when one tuned into just one voice. The script in this performance was secondary anyway. Roma: Could you tell me about your performance Interval? Justyna: My idea was to combine four Polish songs: a war related song, a folk song, a protest song and a pop song with English ones and see what comes out. The songs were sung simultaneously by Agnieszka Podubny and Robin Yorke. The singers did a brilliant job, each time putting their hearts and beautiful voices into it. They also contributed to the final outcome of the piece by bringing their suggestions for the songs, trying them together, looking for harmonies where they were available. The work was presented for the first time during the SPILL Festival of Performance in 2016, during an actual interval between two short pieces I performed myself. The second presentation took place in February 2017 during the opening of my solo exhibition in the Canal Gallery in London. 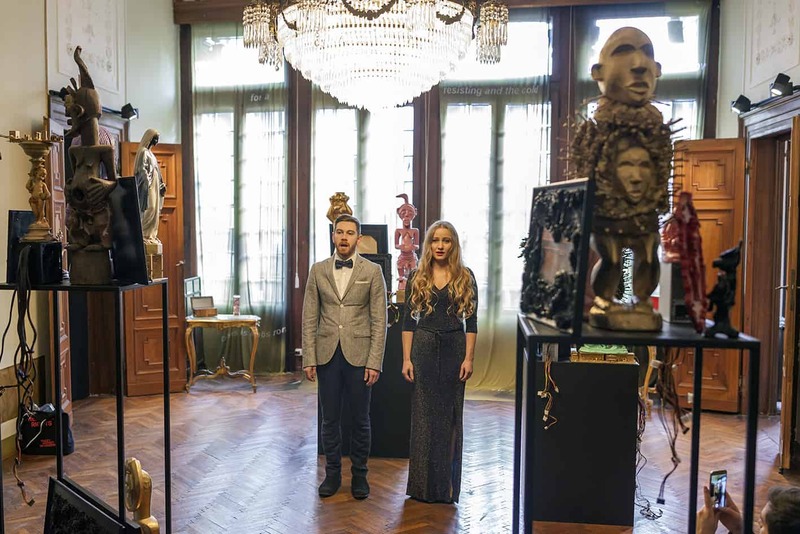 Later, the work was part of the Diaspora Pavilion programme for the closing weekend of 57th Venice Biennale in 2017. The idea for this performance came to me as an immediate response to the Brexit referendum vote, which was followed by xenophobic attacks on Polish people and institutions in the UK. Even though some of these discriminatory incidents were immediately opposed by supportive and good meaning acts, quite suddenly there was a strong feeling that speaking Polish in the streets was not completely safe anymore. These tensions seem to have died down a bit over time. Roma: What message did the performance send? Justyna: Initially the obvious cultural dominance of the English language stands out, because only a Polish audience knows Polish songs. That was very moving for an English lady who shared her reflections with me after the performance in London. It was a bit like giving the less privileged an equal voice – if someone wants to approach this work from a political perspective. Nevertheless, such interpretation should not overwrite the joy and tranquillity, which can be perceived from two separate and self-sufficient voices combined in one, allowing their energy to flow and intertwine in an unexpected way. My intention was to express the beauty and complexity of coexistence. Some people found this performance tender, some even had tears in their eyes. 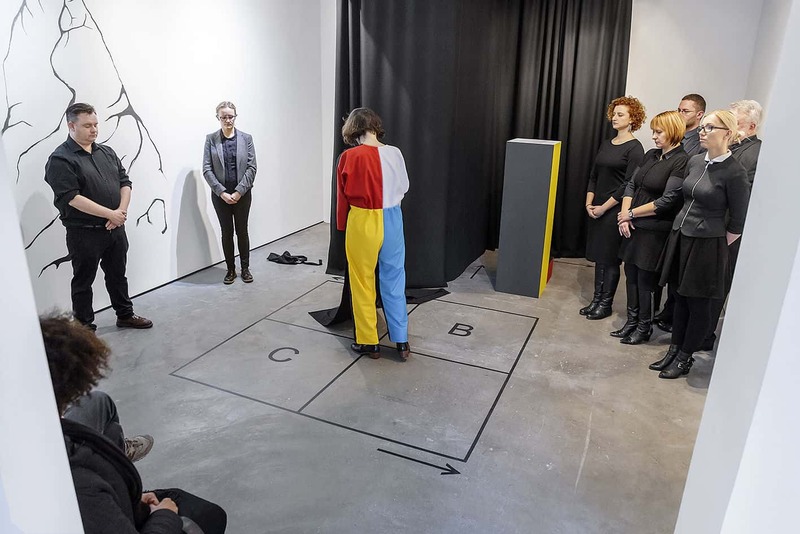 Roma: What do you exhibit in a gallery as a performance artist? Justyna: Besides performances, I also create installations. At the start, they are often part of a performance work, and later they become self-sufficient. I also make video works, photographs and drawings. Right now – and until the 24th of September – the video documenting Everyone, Merry-Go-Round can be viewed in the Contemporary Museum in Wrocław, where it is a part of The Ratcatcher, a large group exhibition curated by Piotr Lisowski. Roma: What is the relationship between your performances and drawings? 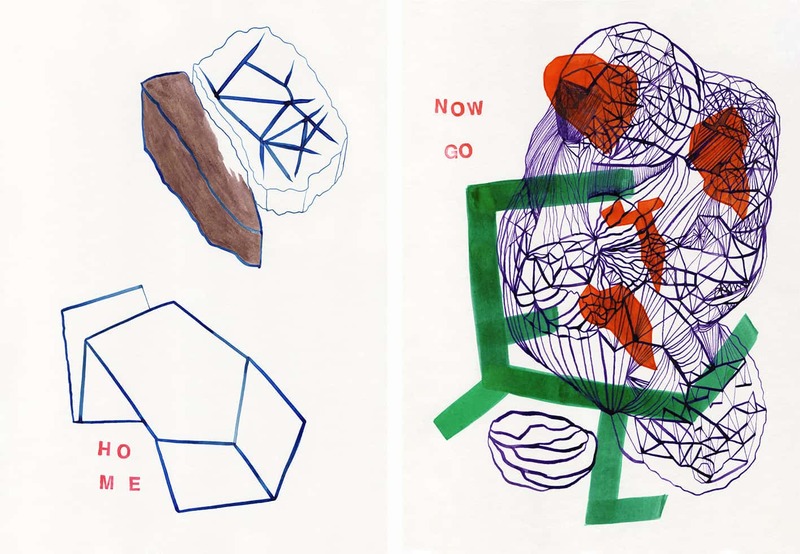 Justyna: They emerged from a habit of doodling and (with my mind focused on performative projects) I didn’t treat them seriously at the beginning. They visualise the same ideas which I put forward through my performances. They started to appear when I moved to London and unexpectedly disconnected from my mother tongue for the necessity of switching to English. I used to write poetry before, and my drawings slowly replaced words, but I still write a lot. 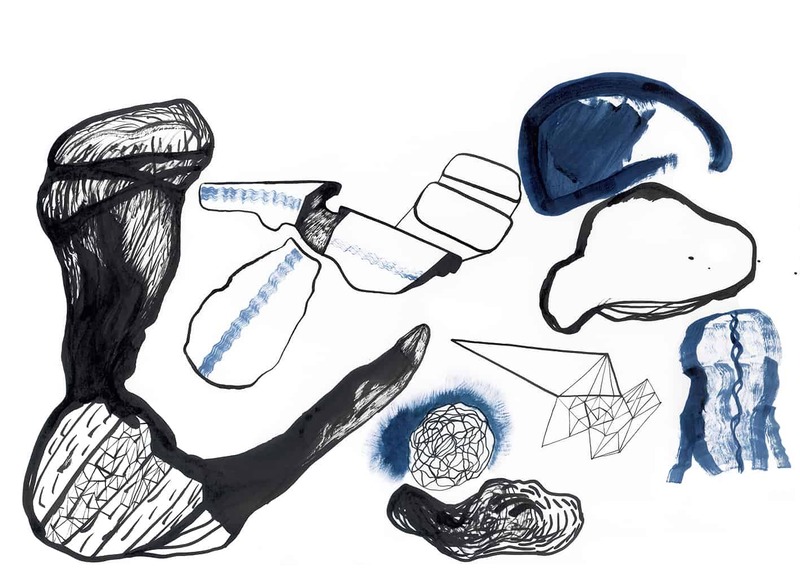 My drawings are mainly abstract compositions; they are a kind of notebook without actual notes. Titles for my performances as well as random ideas for them often appear during the process of drawing. Drawing is a kind of meditation for me. I intentionally start with no project in mind, and the forms appear as if from nothing. As long as I remain connected and focused, the balance between empty spaces and forms flow together nicely. All the drawings I start serve the purpose of focusing my mind, but not each one of them qualifies for an exhibition. I like it, when they surprise me. Roma: In this series of interviews, I try to meet artists in theirs studios but today we are meeting in your home. I was wondering if it’s your choice to not have a studio or maybe there is another reason for that? Justyna: I don’t really need it at the moment, but I rent it sometimes depending on what I work on.